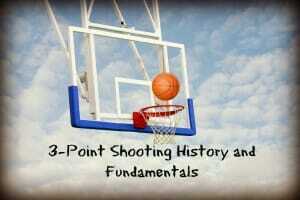 We’re going to talk about the history of the 3-point shot along with the fundamentals that go along with 3-point shooting, which is ideal for you to discuss during basketball practice. Did you know that in the early days of basketball, field goals were worth 3 points? When the game of basketball was invented by Dr. James Naismith in December of 1891, originally a field goal was worth 1 point and there were no free throws. After two years, in 1893, the rules were changed so that a field goal was worth 3 points. In 1897, the current system of any field goal being worth 2 points and a free throw being worth 1 point had been adopted and were here to stay. In 1961, one of the game’s great innovators, Abe Saperstein, established a new league called the ABL, or the American Basketball League, in order to compete against the NBA. Mr. Saperstein organized, founded, and promoted the original Harlem Globetrotters. The Globetrotters were the most financially successful and popular traveling or barnstorming team in the history of the game. Saperstein wanted his new league to have something different than what the NBA offered, so he came up with the idea of the 3-point line at the current distance of 23′ 9″, which is what the NBA now uses. The shot from the 3-point line was nicknamed the 25-footer. Although the 3-point line as shot was a new sensation, the league was not and it folded after only a season and a half. So the 3-point line would disappear for another five years until 1967, when another rebel league, the ABA, or American Basketball Association, adopted the shot. The ABA, equipped with its fancy uniforms; its red, white and blue basketball; and a 3-point shot would wake up the basketball world and shake up sports conservatives to a new and exciting style of play. The game of basketball was never to be the same again. And it was only a matter of time before the game at all levels would embrace the fan favorite 3-point shot. In 1979, the NBA began using the 3-point line as a permanent fixture of their game. Other organizations would soon follow. During the 1983-84 basketball season, Idaho became the first organization and state outside of the NBA to use the 3-point line. In 1987, the rest of the high school organizations and National High School Federation would follow Idaho’s lead and adopt the 3-point line, but they use a shorter distance of only 19′ 9″ from the basket. Internationally, the 3-point line also caught on and was officially adopted by the World Basketball Congress in Munich, Germany, June 23, 1984. The international 3-point line was set at a distance of 21′ 6″ or 6.6 meters from the rim. It was officially used for the first time in the Olympics in 1988. In college basketball the ACC, or Atlantic Coast Conference, experimented with the 3-point line during the 1984-85 season. The rest of the NCAA adopted the 3-point line during the 1985-86 season. The NCAA chose to use the 19′ 9″ distance, which was the same as the Federation of High Schools in the United States. The 3-point line has brought the game back to shorter players. It’s opened up the key and lane areas of the game, made it more explosive and enjoyable. It has also changed the way coaches strategize as well as how players practice. One thing’s for certain: the 3-point line is here to stay and the game is better for it. I like to call this shotput shooting. By putting the ball directly under your elbow when you shoot, not only will you shoot the ball in a straight line, but it will also add strength to the shot as you release. We teach with the L position because it’s easy memory for young players to pick up and develop. If I put the ball in her right hand, her right thumb is going to touch her left palm and she’ll have a T that she can use to help her shoot effectively. The incorrect thing to do in these situations would be to have your hand in front of the ball, which forces you to pull the ball backwards and shoot, or to place your hand on top of the ball, which forces you to cling to the ball as you shoot and slows down your shot, forcing you to pull your shot short. 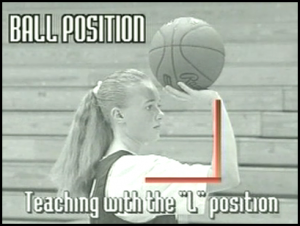 So if you’re a young player or a coach that wants to teach better shooting skills, two simple letters: L and T. We make a simple L; the ball goes there. 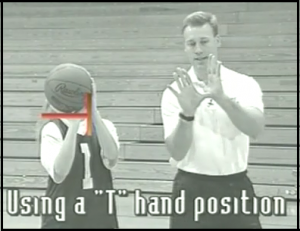 We form a T with our right thumb and our left hand, and the ball goes in there. 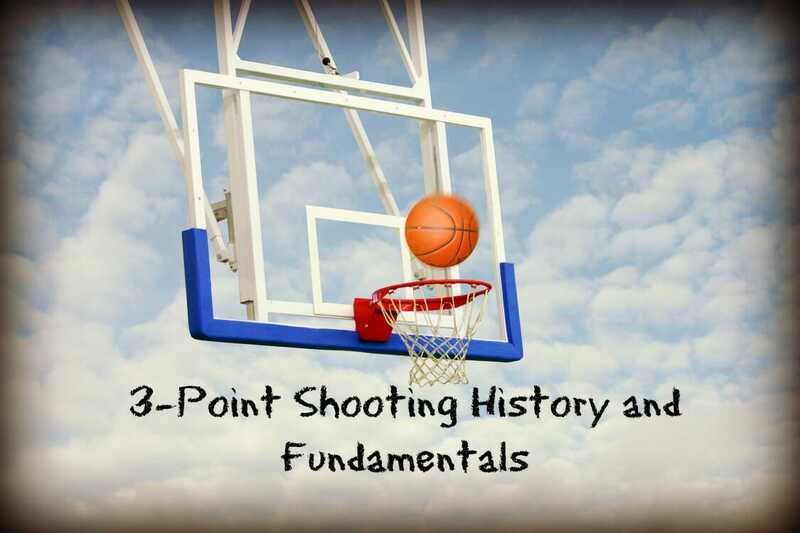 Now that you have a grasp of the history and fundamentals of 3-point shooting, you can share this information with your players during basketball practice to give them a good basis to work off of so that they can become pro 3-point shooters. Did you find this history and fundamental lesson useful? Be sure to share it with fellow coaches on Pinterest or Facebook!